When the greatest poet of the 20th century* writes a playful collection about cats targeted at children (albeit in such a way as to endow them with a pretty remarkable vocabulary by the end) it is, I guess, fair game for the likes of Andrew Lloyd Webber. Actually, I really enjoyed 'Cats' as a 9-year-old. We had this amazingly inspirational and creative teacher, who (among many other things) taught us dance and read us poetry and took us to the theatre. So I've always remembered it with fondness -- a rich, multi-dimensional, culturally-expanding experience. The big, crowd-pleasing, 'hit single' song from the show is 'Memory'. It's not from 'Old Possum' and I always assumed the vaguely harmless, pop-ballad-like words were just 'original lyrics'. But no! Imagine my distress when, just as I was beginning to really 'discover' T.S. Eliot, I came across 'Rhapsody on a Windy Night'...a beautiful, bleak, poignant poem evoking a sense of weariness, loneliness, fragility... Here's a few edited highlights (go read the whole thing though, it's amazing). 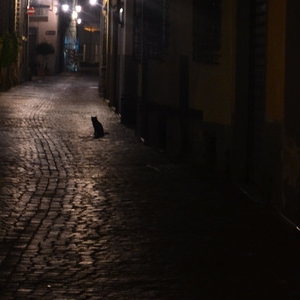 Turns out 'Memory' is a loose paraphrase of odds and ends of 'some other old Eliot poem they turned up' which just happened (conveniently) to be set in a street at night and to mention a cat and the moon! Talk about 'dumbing down'...all of the layered richness of the above, forced into a pop-song meter and trite, easily-digestible ideas: "Every street lamp seems to beat a fatalistic warning. Someone mutters, and a street lamp gutters, and soon it will be morning." No morsels of rancid butter, no dead geraniums, no knives twisting here...wouldn't want to make the record-buying public feel uncomfortable. Eliot is not for paraphrasing! 'La lune ne garde aucune rancune'...but, it seems, I do. Part of the reason this frustrates me is that I worry that everyone wants everything to be easy all the time. To be nice, to fit into what they already understand. No one wants to have to think about anything... I'm not saying that we should intellectualise everything, though I'm *very* frequently guilty of that type of snobbery and even as I write I'm aware that I'm not entirely innocent right now. But I do think that grappling with the difficult or the unfamiliar is (or at least, can be) a context for real growth to take place. The Christian faith is remarkable on this front; there is lots of deep and mysterious and mind-blowing stuff going on, but there is also a very simple invitation that is comprehensible at the most basic, immediate human level. You do not need a degree in theology to follow Jesus. There is no test you need to pass to receive God's grace -- neither an intellectual one nor a spiritual nor behavioural one. But once we have embarked on that relationship, we are called to love God with 'all our heart and soul and mind' (Matt 22:37). And the wonderful thing about the Bible is that it speaks to our hearts (in the poetry of the Psalms, or the outcry of Lamentations, for example), our souls (e.g. through the instruction of Proverbs, or the recorded teachings of Jesus), and our minds (the historical accounts of the New Testament presented for our rational assessment, the deep theology of Paul's letters...). But our response is all too often to extract the doctrine and ignore the bits left over (and the contexts in which ideas are conveyed) as 'surplus to requirement'. Don't get me wrong: I'm not dismissing the usefulness of doctrine -- the distillation of great and complex truths into something more readily and immediately grasped. But I begin to wonder whether we have become too reliant on it; too content with the straightforward answer. After all, God did not communicate with us in a list of pithy credal statements: 'sign up to these and all will be well'. He gave us the Bible, and He gave us the world, and He gave us Jesus. By the human exercise of codification we begin to make sense of a mysterious, multi-faceted reality -- and to find ways of explaining it to others. But too quickly it becomes a distraction -- or even a protection -- from that very reality it is supposed to be communicating. We need courage to engage once more with the apparent messiness and to grapple with a revelation that simply can't be simplified. The doctrine of the Trinity, for example. Wow, that's a tricky one. It took years of wise, collaborative, Spirit-led (so I believe) scholarship to start to get to grips with that. Even now it is a concern for many when they learn that it is not explicitly taught anywhere in the Bible. To me, though, this serves to show exactly why doctrine can never replace the Bible. The direct doctrinal statement informs me of the concept but does little to convince; it is in the 'not-in-so-many-words' revelation of the Bible as a whole that I start to see the truth of it confirmed in reality (that is, the Bible communicates it in more than words, not less). [Thumbnail image cc from nironadsu on Flickr]. Yes. Over-simplification. Bullet points. Our (western) culture is rushing headlong away from thinking/sweating an issue; Radio 4's today program does this on a daily basis - 4 mins to grapple a complex 'story' (NHS, Euro, Syria, Mugabe ...) and reduce it to a summary soundbite often with the help of 2 opponents who speak but don't hear. I love it when they agree and the presenter doesn't know what to do! So if it's all around us, we import it into our Christian diet, or MacChurch as it often seems; doing deeper, maybe, sadly for some, but scratching the surface in reality.But not a new problem as NT records 'you should be on sold food by now' - sadly the audience's appetite seems to dictate the menu. Thanks, Mike - especially nice to hear your thoughts on this. I always appreciate it when you pull us up on such thinking at homegroup (assuming you are *that* Mike…the comment system leaves room for ambiguity), and I did think of you as I wrote parts of it! (That's not to hold you responsible for my ramblings of course; I'm sure you would have put it much better, but I am the one with too much free time on my hands). "[This idea] is, of course, already present in the classic statements of Christian doctrines, the great early creeds. They are not simply checklists that could in principle be presented in any order at all. They consciously tell the story—precisely the scriptural story!—from creation to new creation, focusing particularly, of course, on Jesus and summing up what Scripture says about him in a powerful, brief narrative.... When the larger story needs to be put within a particular discourse, for argumentative, didactic, rhetorical, or whatever other purpose, it makes sense, and is not inimical to its own character, to telescope it together and allow it, suitably bagged up, to take its place in that new context—just as long as we realize that it will collect mildew if we leave it in its bag forever."